2. Richards R., Glms D. G. and Badhu M., (1993), “Seismic Bearing Capacity ad Settlement of Foundations”, Geotech. Engrg. Div., Am. Soc. Civ. Engrs., 1993, 119 No. 4, 662-674. 3. Budhu, M. and Al-Karni, A. (1993), “Seismic Bearing Capacity of Soils”, Geotechnique, Vol. 43, No. 1, pp 181-187. 4. Dormieux, L and Pecker, A. (1995), “Seismic Bearing Capacity of Foundation on Cohesionless Soil”, J. Geotech. Engrs., ASCE 121 (3), pp 300-303. 5. Soubra, A.H. (1997), “Seismic Bearing Capacity of Sallow Strip Footings in Seismic Conditions” Proc. Ins. th. Civ. Engrg, London, 125 (94), pp 230-241. 6. Soubra, A.H (1999), “Upper Bound Solution for Bearing Capacity of Foundations”, J. Geotechnical and Geo Environmental Engineering, ASCE, Vol. 125, No. 1, pp 59-68. 7. Zhu, D. (2000), “The Least Upper-Bound Solution for Bearing Capacity Factor”, Soils and Foundations, Vol 40, No. 1, pp 123-129. 8. Askari, F, and Farzaneh O. (2003), “Upper-Bound Solution for Seismic Bearing Capacity of shallow Foundation near Slopes”, Geotechnique, Vol. 53, No. 8, pp 697-702. 9. Kumar, J and V. B. K. Mohan Rao (2002), “Seismic Bearing Capacity Factors for Spread Foundation”, Geotechnique, Vol. 52, No. 2. pp 79-88. 10. Kumar, j & V. B. K. Mohan Rao (2003), “Seismic Bearing Capacity of Foundation on Slopes”, Geotechnique, Vol. 53, No 3 pp 347-361. 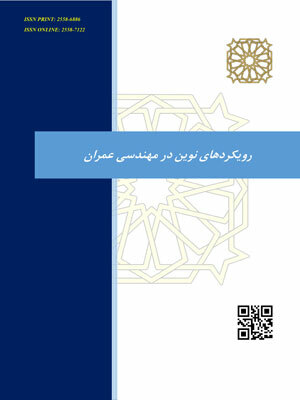 11- دریا باری (1385)، "تعیین ظرفیت باربری لرزه‌ای پی‌های نواری با استفاده از روش خطوطمشخصه" رساله کارشناسی ارشد، دانشگاه آزاد اسلامی واحد علوم و تحقیقات. 12. Cascone, E., & Casablanca, O. (2016), “Static and seismic bearing capacity of shallow strip footings”, Soil Dynamics and Earthquake Engineering, 84, 204-223.